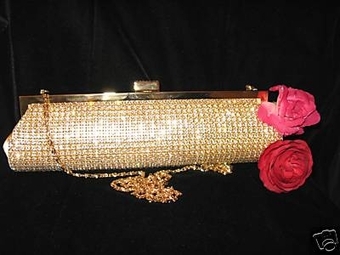 Ramona-ELEGANT Gold Swarovski Crystal Clutch/Purse-SALE!! 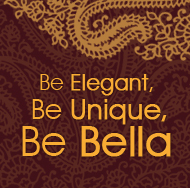 HOME / WEDDING ACCESSORIES / Crystal Evening Purses / Ramona-ELEGANT Gold Swarovski Crystal Clutch/Purse-SALE!! Description: Stunning Elegant Gold Satin Clutch Purse. Fully decorated with Swarovski Crystals - Gold Metal with Goldr prong settings for crystals -top quality satin - optional shoulder chain included -extremely well made/couture quality - free sample chanel perfume - extra swarovski crystals fully lined in satin - decorative trim - protective storage bag and box -- bag measures approx 10 1/2�x 3 1/4�.